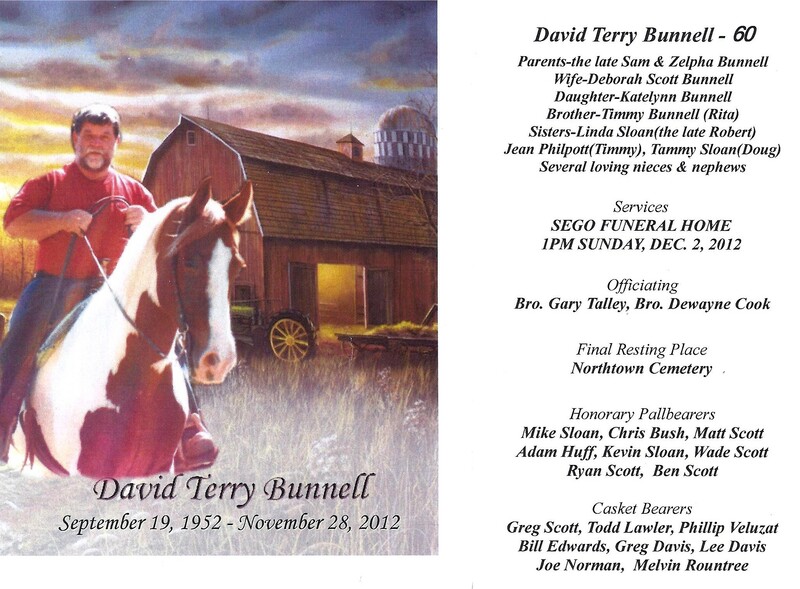 David Terry Bunnell, 60 of Horse Cave passed away suddenly Wednesday night at his home. The Northtown native was a son of the late Sam and Zelphia Bybee Bunnell. David was an equipment operator with the State Highway Dept. He was trail boss for the Sheltowee Trail Ride and the only rider that rode every ride for 33years. Funeral services for David Terry Bunnell will be 1pm Sunday in the chapel of Sego Funeral Home with Bro. Gary Talley & Bro. Dewayne Cook officiating. Burial will be in the Northtown Cemetery. Visitation will be Friday from 4-8pm, Saturday from 9am-8pm and after 9am Sunday at the Sego Funeral Home until time for services. Memorial donations may be made to the Sheltowee Trail Ride 872 Nacke Pike, Cecilia, KY 42724.